Puertas, M.; Roca, M.; Domenech, J.; Gasso, S.
Web 2.0 or social web is understood as the group of applications and resources of Internet that facilitate the exchange of information and the collaborative work. Most of these tools are free and can be applied during the preparation and the communication of academic projects. Apart from minimizing the time and the effort, its use promotes the collaboration and communication, the critical appraisal and the exchange of knowledge. Under the denomination “Project 2.0” a teaching material has been produced with a selection of these technological resources classified in function of their utility during the different phases of development of the project: searching information, creating virtual surveys, reading and synthesis of the documents, storing files in the cloud, analyzing data, creating conceptual maps, writing, managing bibliographic references, preparing the presentation for the oral presentations, etc. This resource has been presented in the different subjects “Projects” at Escola Tècnica Superior d’Enginyeries Industrial i Aeronàutica de Terrassa (ETSEIAT) of the Universitat Politècnica de Catalunya • BarcelonaTech (UPC). In a very near future the use of these tools in the preparation of the final degree projects on the part of the students is going to be extended and evaluated. Puertas, M. [et al.]. 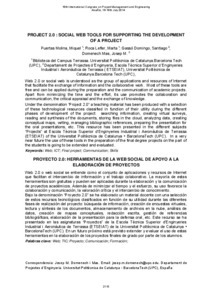 Proyecto 2.0: herramientas de la web social de apoyo a la elaboración de proyectos. A: International Congress on Project Engineering. "Proceedings from the 18th International Congress on Project Engineering". Alcañiz: 2014.